Computex 2011 is officially underway. Although technically it started yesterday with informal meetings at LAX, Ian and I kicked off our plethora of meetings at the show today with ASRock. ASRock met with us this morning bearing goodies, three new motherboards to be specific. 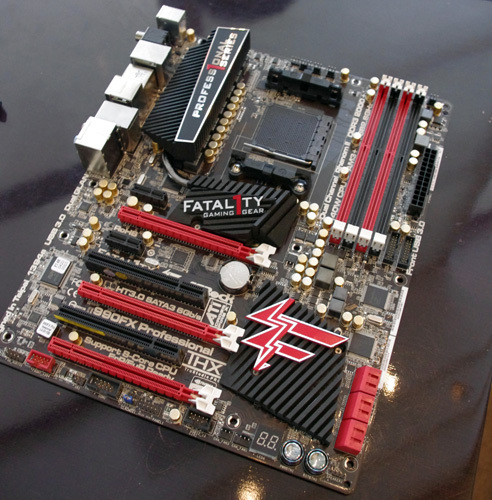 First up was the A75 Extreme6, ASRock's Socket-FM1 motherboard designed to accept AMD's A-series Llano APUs. A number of leaks have already happened around Llano so if you want more details I'd suggest going to the source at this point. We're working on coverage of the platform but it'll be a little while longer before we can post on it. Llano is mainly targeted at mobile systems first, but we will see desktop platforms going forward. Llano will become AMD's mainstream desktop CPU over the coming quarters, replacing the Athlon II and Phenom II in many cases. Just above Llano we will have the long awaited Bulldozer CPU. AMD originally wanted to launch Bulldozer at Computex but performance issues with its B0 and B1 stepping chips pushed back the launch. Now we're looking at a late July launch with B2 silicon, but performance today is a big unknown. Apparently the performance of B1 stepping silicon doesn't look too good. Bulldozer will be mechanically compatible with Socket-AM3 motherboards but AMD will only officially support the CPU on AM3+ motherboards. 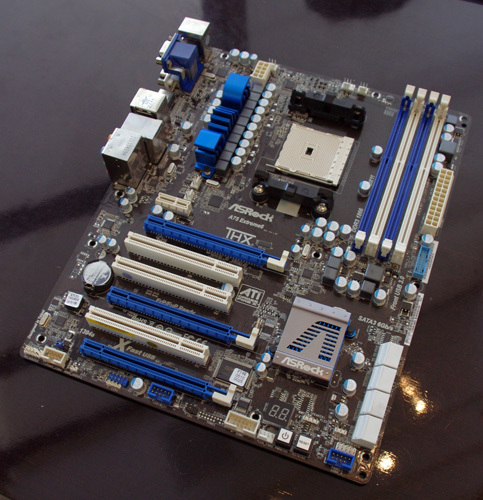 To differentiate AM3+ from AM3 motherboards AMD is releasing a new chipset: the 9-series. Functionally the 9-series chipset is no different from the 8-series that it replaces; it'll simply be used on AM3+ boards exclusively. Obviously a very high end motherboard, ASRock included two front panel USB 3.0 headers on its 990FX board. There are also three PCIe x16 slots and six 6Gbps SATA ports driven off of the 990FX chipset itself. 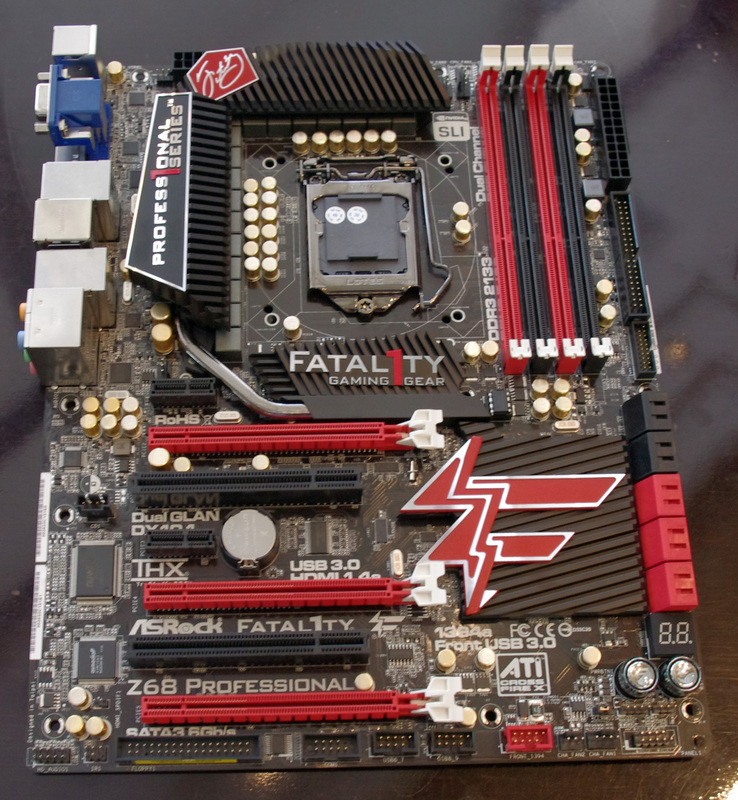 Finally we have ASRock's Z68 Professional motherboard, once again with Fatal1ty branding. At Jonathan Wendel's (Fatal1ty) request, the Z68 Professional includes an IDE port for optical drives and a floppy drive connector as well. We've got several more meetings lined up so expect more coverage from the show today. It may not be about clock rates, and more about design errors that cause logic problems in how instructions are executed. These errors can be discovered and fixed, which of course means a new stepping. Now, there is one other issue here, and that is about the speed of the chips. As long as AMD can come up with a chip that performs as well as an Intel chip at the same price point, AMD will sell quite a few processors. what? floppy? I might could see the point in an IDE connector but floppy?